Natural plants bring unsurpassed charm inside a dwelling, thanks to their diverse leaf shapes, colors, textures and growing styles. Be it modern or more on the country style, your house will look more lively and sophisticated with some thoughtfully-placed flower pots that highlight certain indoor areas. And growing them does not have to become a chore; by choosing some low-maintenance species that also look enticing, you will add effortless panache to your interior design. When it comes to stylish indoor plants, adaptable varieties that come in a wide array of colors, with interestingly shaped leaves are ideal; in this way, a room will gain depth and interest, with minimum effort. And that is why Bromeliads have become so mainstreamed lately. Tolerant to drought and temperature changes between 55° and 80°F (13° and 30°C), while requiring to be watered only once a week (or even less often in winter), these exotic rainforest plants prefer sunny spaces and window sills, so rooms oriented towards the south or east are perfect. Aechmea fascinata is a popular plant in the Bromeliad family due to its spectacular rich flower; another one is Neoregelia, appreciated for its decorative leaves that have red or yellow stripes on them, along with Guzmania genus, whose tall red floweret is admired for its elegance. A combination between these varieties will create a rich and glamorous ensemble that is bound to make a design statement anywhere in your house. All these varieties are also epiphytical, meaning they can be mounted on logs, bark or boards, in which case they require consistent watering and misting, i.e. once every two days. Laying some moss around the roots will ease moisture retention and will add extra charm. 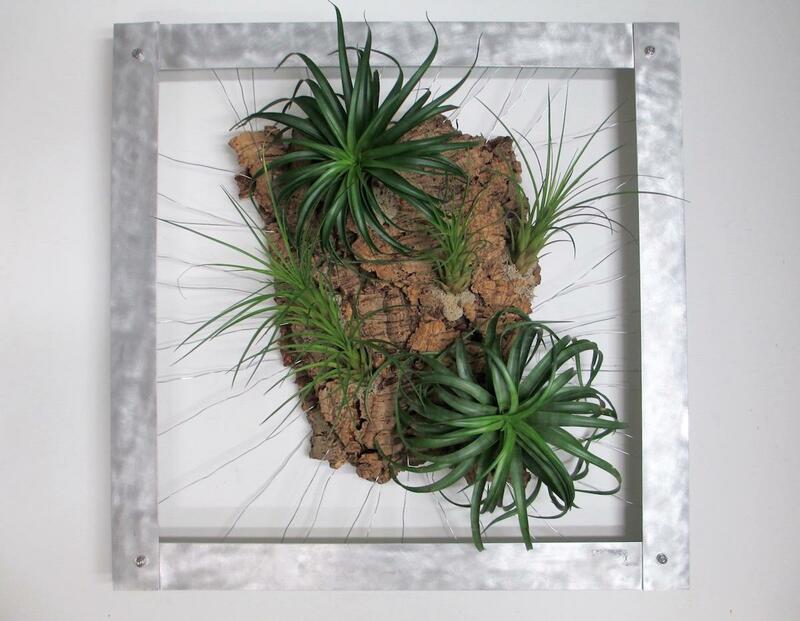 As a result, an epiphytic Bromeliad can turn into your next central piece on a living room wall: placed near some of your favorite art pieces, a mounted flower can liven up the overall décor; even better, you can frame the ensemble to match other hanged paintings, for a seamless blend. Bromeliads love moisture, but demand a fast-draining soil at the same time. 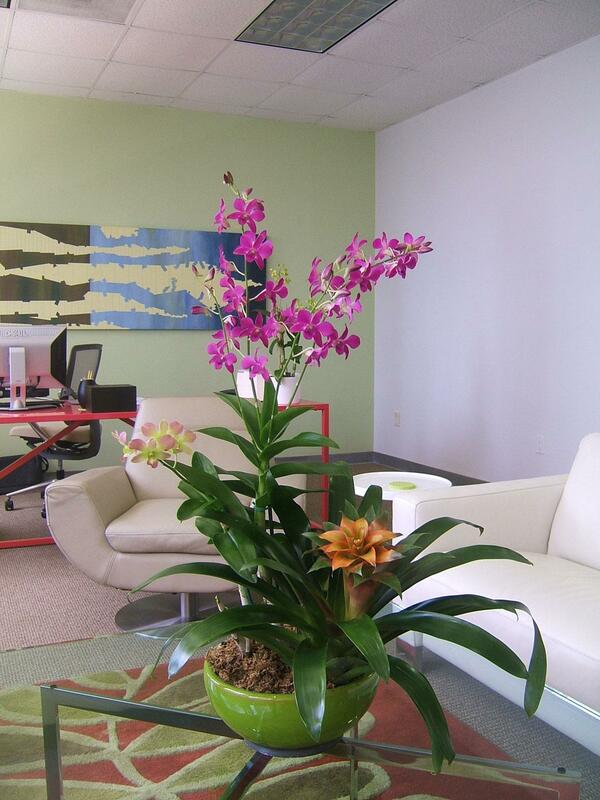 Actually, they need growing conditions similar to that of orchids; therefore, a potted mix between the two will work both in terms of maintenance and design. Just place the pair on one of your coffee tables, along with some colorful albums, and the area will instantly gain some serious panache. Succulents are another family of plants that is all the rage in the interior design business and it is easy to see why. 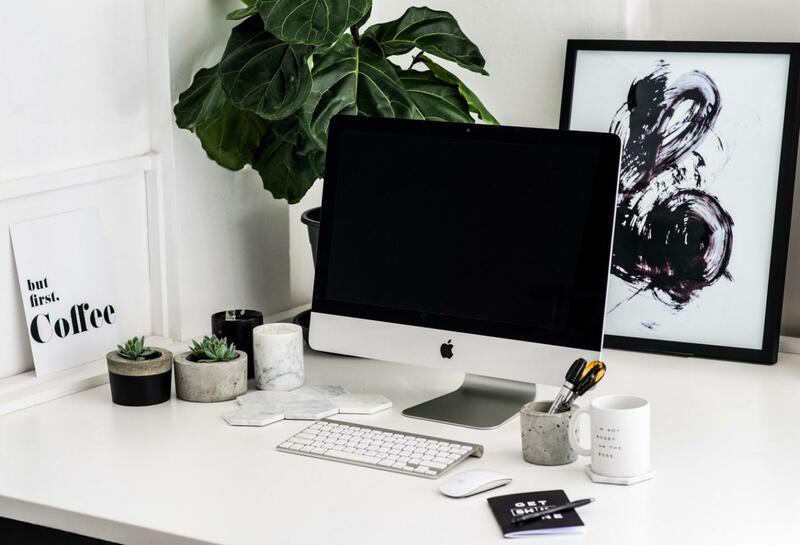 Fleshy, whimsical and with intricate patterns, they can transform a plain-looking desk or book shelf into a furniture piece that looks as if it was taken straight out of a Pinterest photo. Their plump leaves act as a water storage, which makes them easy to grow; they will definitely survive your holiday, careless watering habits or busy schedule. Some of the most well-known succulents are the aloe plant and cacti. 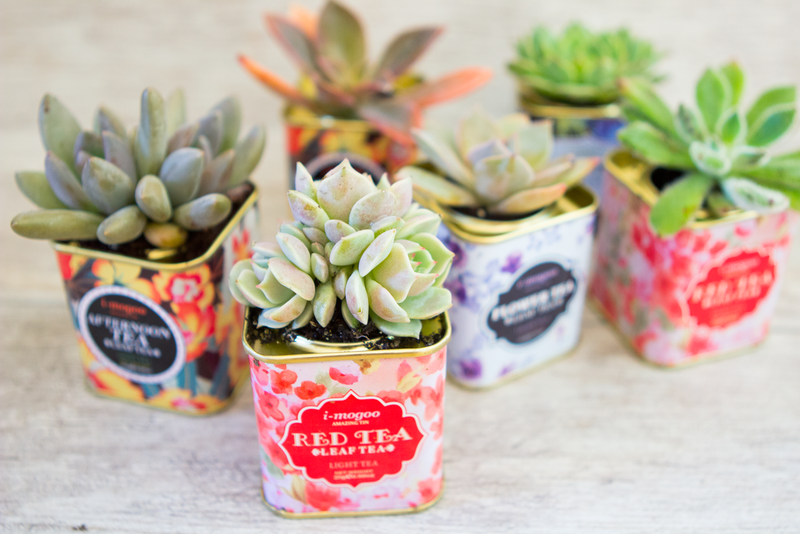 A great way to use them when decorating is to have several types of succulents similar in size, placed in tiny matching pots; any container can be used, from classic tea tins or beautiful stone-carved pieces to porcelain coffee cups, as long as they look neat. In this way, the incredible diversity of these delightful little plants will be underlined. 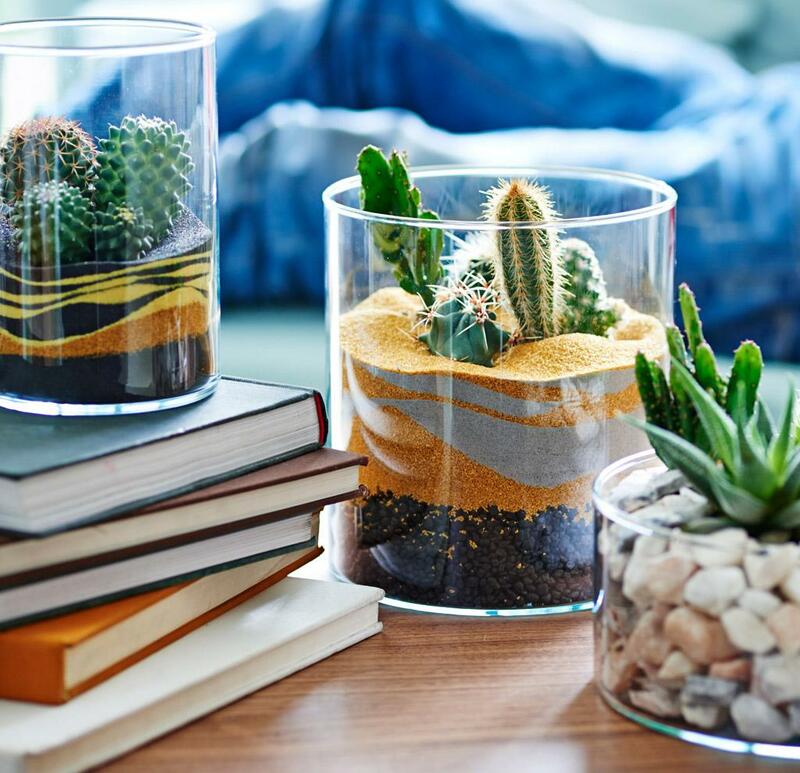 Another impressive way to decorate with succulents is to build a miniature terrarium; with a bit of soil, ornamental sand and stones and a transparent vase, you can create a small-scale dessert for these natural trinkets. Throw in some gorgeous accessories and a few glossy magazines, and your living room coffee table or bedroom nightstand will look fabulous. 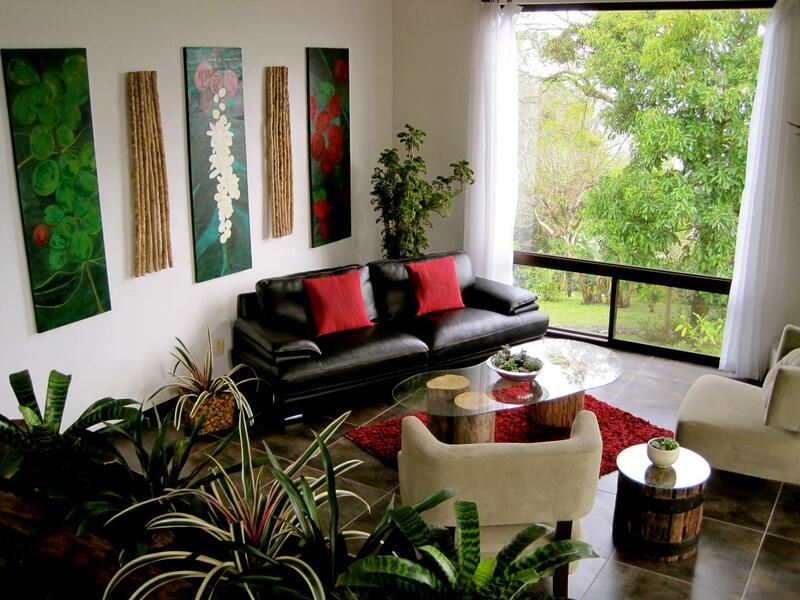 Ornamental greenery can bring beautiful texture and refreshing vibes within a living room. Whether modern or traditional, a space will gain extra elegance once carefully curated plants are used to highlight existing furniture pieces or architectural elements. 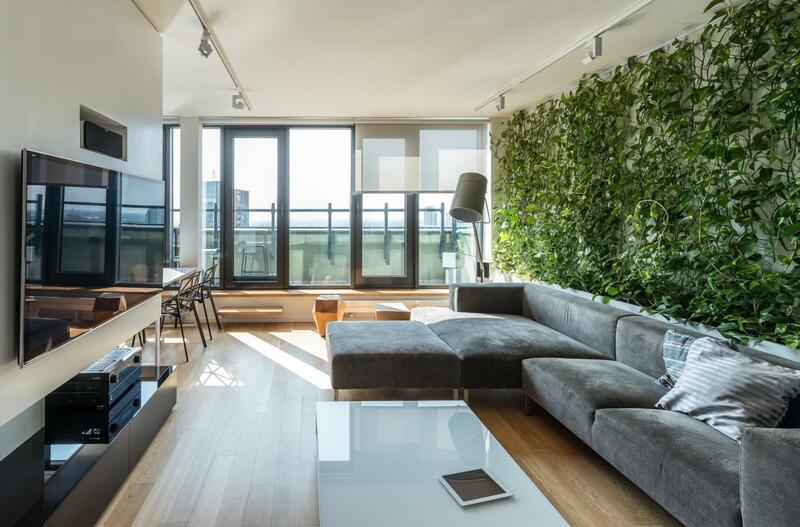 Sometimes, a leafy tall plant is all that a minimalist lounge needs in order to feel more welcoming. Position the pot in a corner that is immediately visible once you enter the space, in order to maximize the visual effect. For balance, you can also add a vase of freshly-cut flowers on the table. 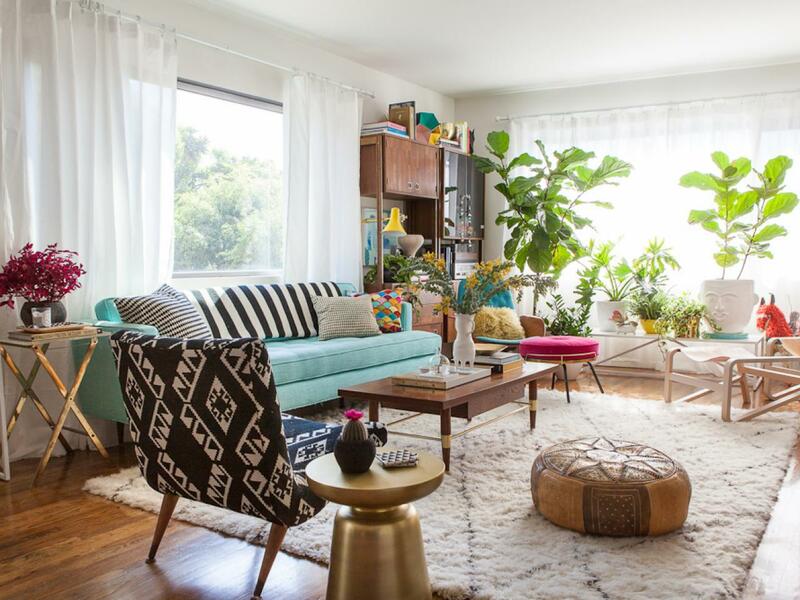 In case your living room looks more eclectic, containing a blend of wood and metal pieces, with mismatched seating places and a diversity of collectibles, adding plants to the mix will help the design feel cohesive and effortless. Combine tall indoor trees with middle-sized bromeliads and small pots of overflowing ivy to create a focal green area next to the window, and scatter a few other delicate plants and succulents on the side tables, for a well-balanced approach. Also, do not be put off by the lack of space. You can always locate a few plants in those spots that you do not use much anyway (such as behind the sofa, on the window sill or next to the door) or in the areas that already host other ornaments (for example on a side table or coffee tray). To enhance the effect and achieve a consistent appearance, purchase a few decorative pillows or window curtain fabrics with plant motifs and distribute them on the existing sofa or chairs. Another great way to make use of a limited space is to use it vertically. 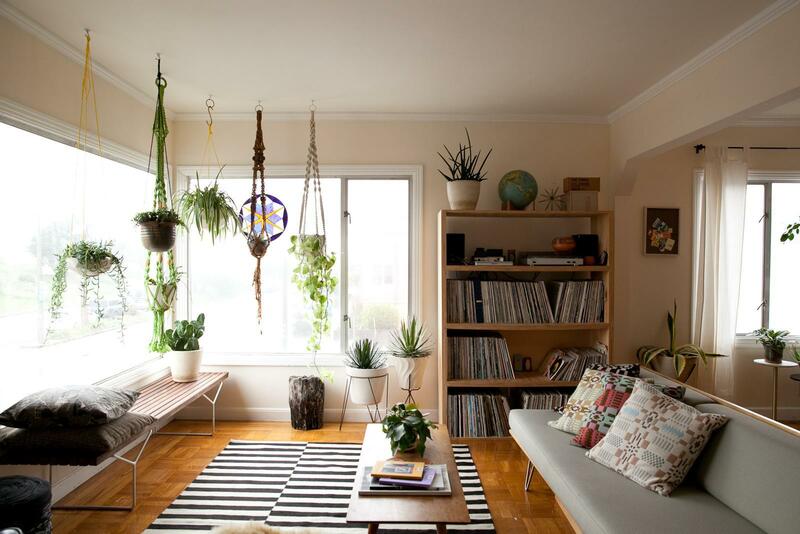 Basically, you can decorate your living room with plants that hang from the ceiling in beautiful rounded pots held with handcrafted macramé planters; vary their heights and color, alternate between flowing and simple genus, and the visual appeal will be massive. 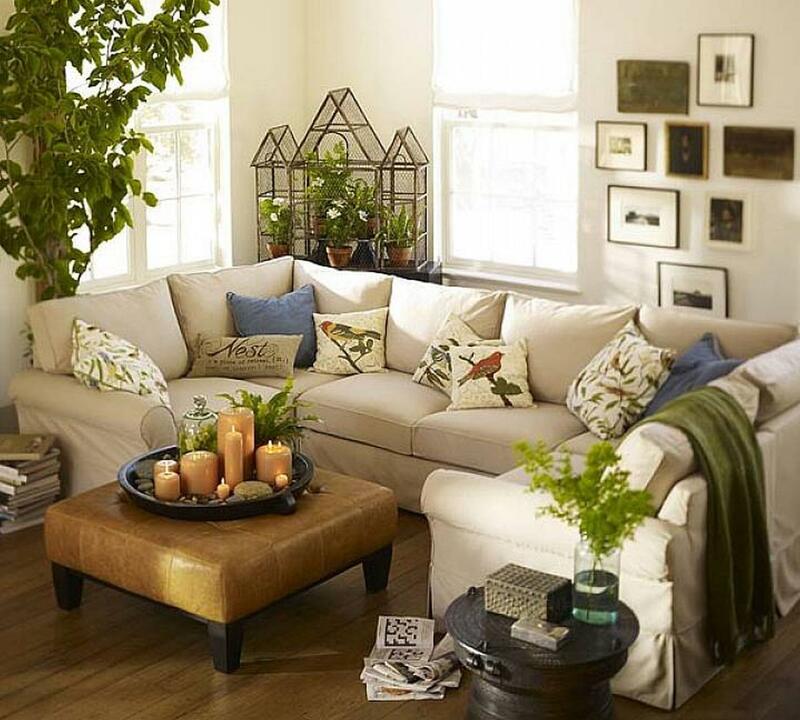 The plants in your living room are also able to highlight different interest areas; a cozy reading corner will look grounded and have its own distinctive style with the help of a cleverly-placed plant. 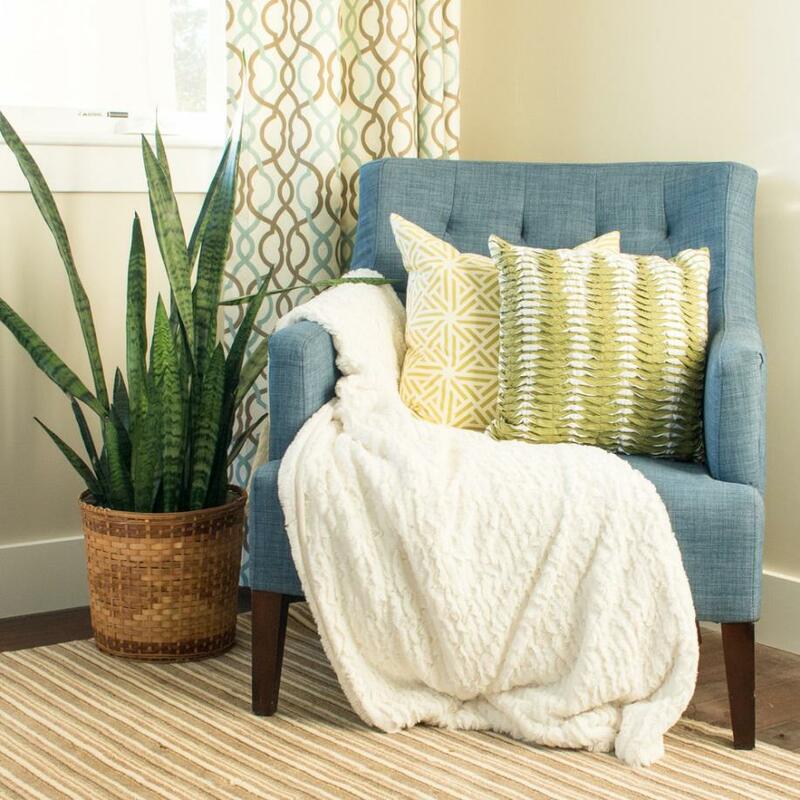 Located next to a lavish upholstered armchair whose appeal is enhanced with decorative pillows and snug throws, a slender snake plant, for instance, will work true magic. Just make sure its height is similar to that of the main furniture piece, so it does not become overpowered by it. The shape and texture of the pot should also be carefully picked, to underline even more the idea of comfort and relaxation; try textured finishes or natural woven grasses. 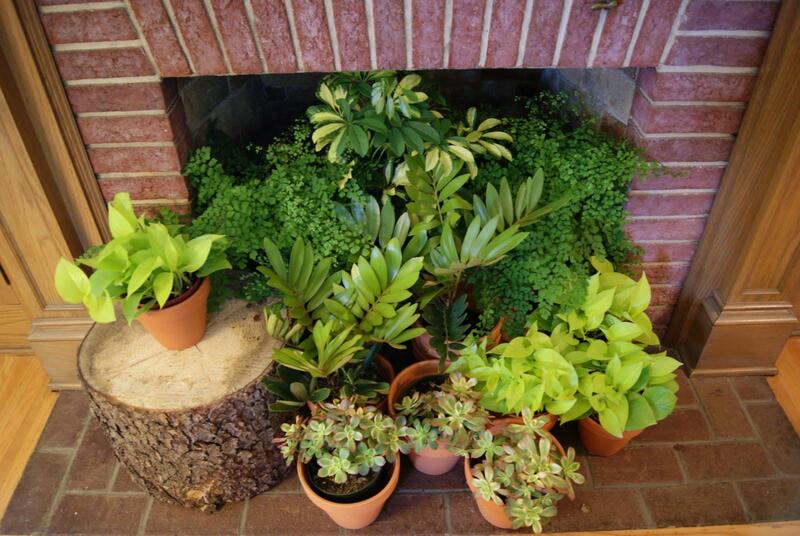 A lovely approach to repurpose a fireplace during summer is to fill it with an assortment of pretty-looking house plants. Variation is key; mingle different green, burgundy and yellowish pigments, with whimsical leaf shapes and overflowing kinds. Also, alternate the plants’ height and position to obtain a pleasing final assembly. Of course, you can further accentuate the design with pieces of traditional pottery or rustic logs. Sometimes, big things come in small packages… or small pots for that matter! The appearance of a window or living room cabinet can be boosted with a multitude of little graceful plants arranged tidily. The outcome is enchanting! And if you really want to go over-the-top and ‘think outside the pot’ so to speak, why not try a fully-fledged living wall. Impressive, architectural and fragile at the same time, this decorative endeavor will definitely make a statement, by looking as if a slice of the rain forest had been shipped straight within your lounge. 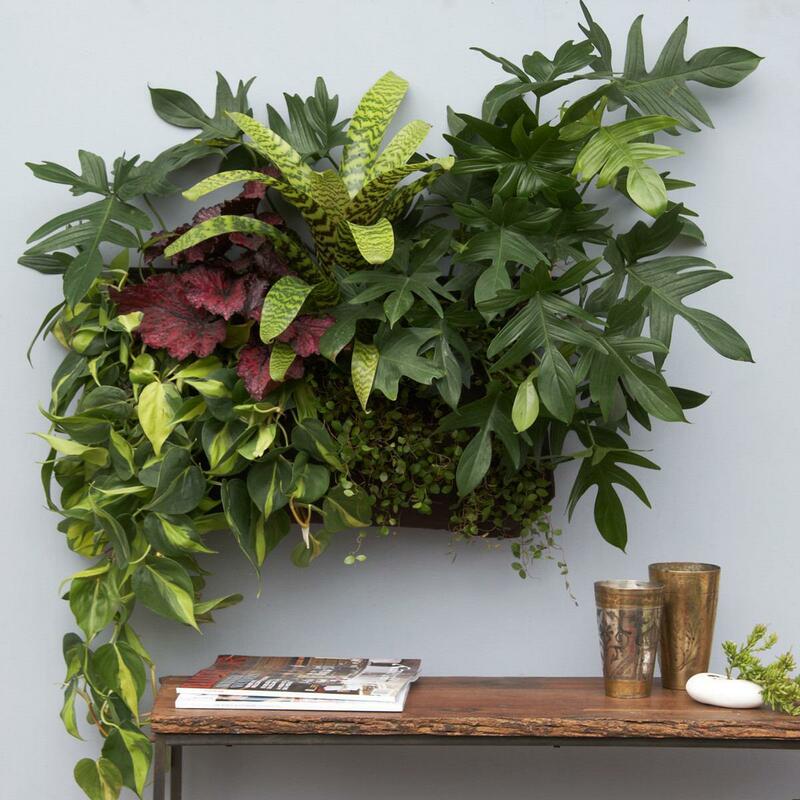 One way to do it is by installing racks against the wall and hang plants from them in such a way that their foliage obscures the pots and the support; the plants should be placed right next to each other and be of different varieties, to mimic the diversity and richness of the wild. Mix green and reddish leaves with simple and variegated patterns, and add a few cascading species in order to create interest and a sense of nonchalance. Another way is to use climbing plants, by allowing them to grow vertically along the wall. Set a generous pot on the floor (in can be behind a couch if you do not want it to be visible) and install some steep ropes on which to curl, and in a few months your living wall will be ready. A sturdy horizontal rack should also be fixed close to the ceiling, to allow the plants to rest securely, because they tend to get quite heavy once they develop. Among the low-maintenance indoor plants that you can use for this kind of project there are English ivy, pothos (devil’s ivy) and philodendron. Water them moderately once a week and collect the yellowing leaves to keep them in shape. Also, keep pruning the stalks once the plants have climbed to the desired height and mist the foliage, so that your piece of nature can look prim and proper. 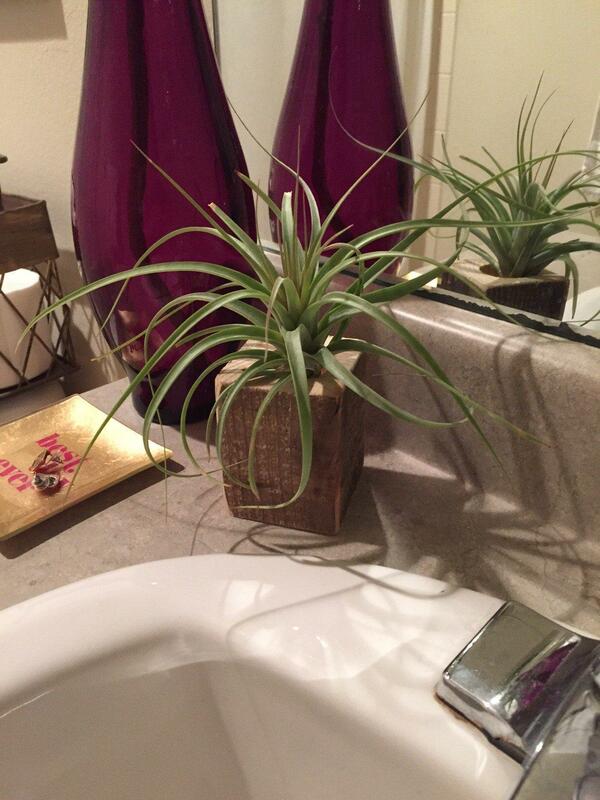 Tropical plants are the best choice for bathrooms because they thrive in high-humidity areas with lower light levels. 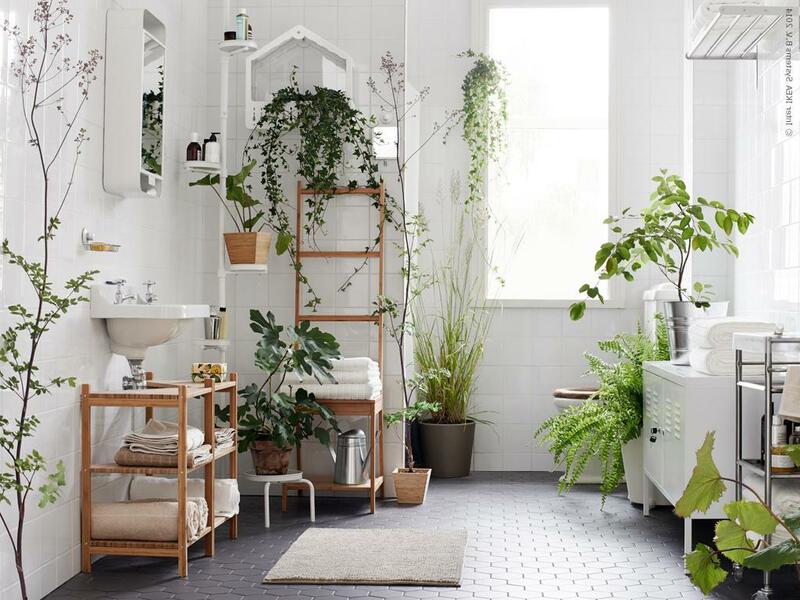 Varieties such as Sansevieria trifasciata (Snake plant), Chlorophytum comosum (Spider plant), Spathiphyllum (Peace lily) or Aspidistra elatior (Cast-iron plant) that are always green and have multiple leaves that either grow tall or elegantly bend over the pot, will transform your bathroom in a delightful botanical garden. Bamboo stalks look highly decorative as well, especially if you purchase the twisted version; what’s best, they can thrive in a simple transparent vase with just some pebbles and water in it, requiring to be watered only once a week. Now that’s Zen plant growing! 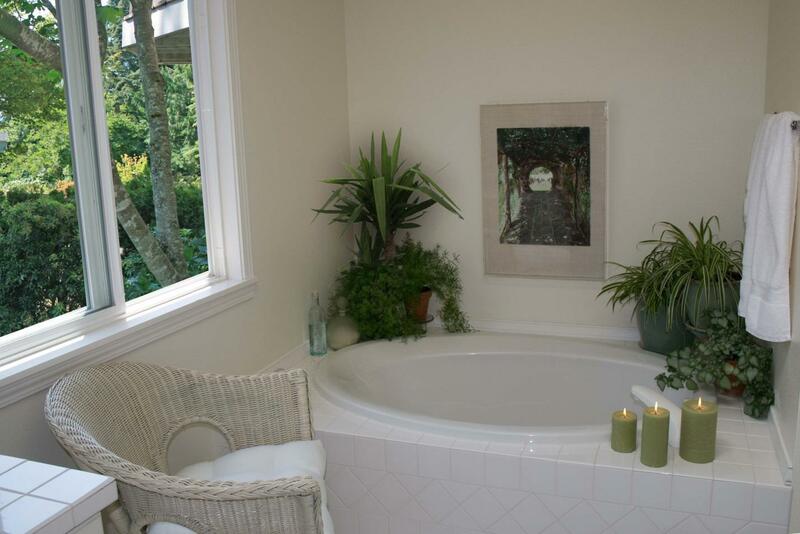 Ferns and ivy are other two types of plants that will wonderfully adapt to your bathroom. Their impressive, yet delicate foliage is sure to complement both modern stainless steel and vintage-looking fittings, adding individual style. Place a rich fern next to your bath and hang some climbing ivy on a top shelf and the room will gain a refreshed and relaxing appearance. 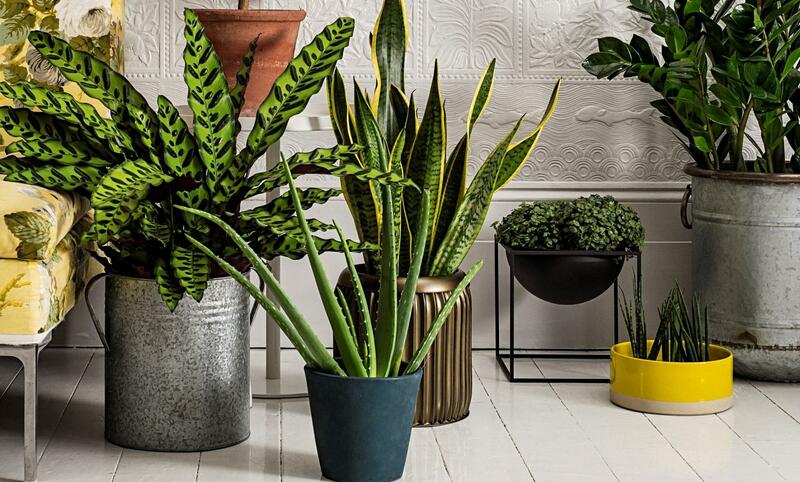 A mix between these plants positioned in a corner or nook can look truly extraordinary, thanks to their diverse contours and distinctive green shades, so go on and experiment with different kinds. To boot, they are also well-known for their air-filtering capabilities, turning your restroom in a cleaner, safer environment. And if the available space does not allow you to use many plants in the bathroom, or you just prefer simplicity, placing one or two textured pots with tiny varieties on the sink or edge of the tub will go a long way. Despite the favorable growing conditions that our bathrooms provide, there are a few points to consider when caring for the plants. 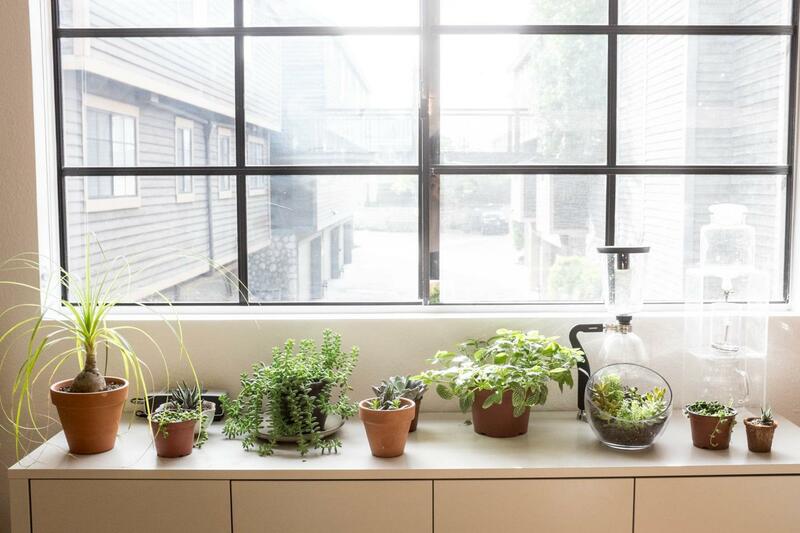 First of all, make sure that there is some light coming through the bathroom window; some genus may not require much of it, but no plant can live without natural light either. And second, keep watering them once a week during the cold season and twice a week during hot weather. 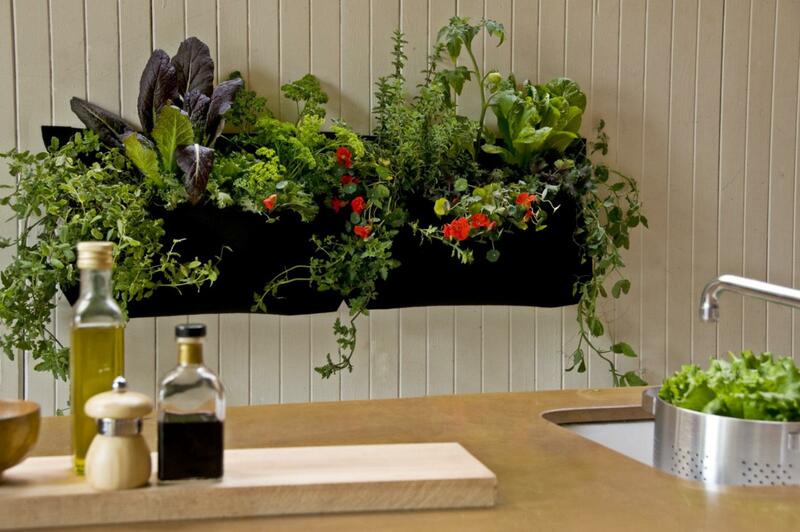 Decorating with plants inside the kitchen is not only for aesthetic purposes, but also for functional ones. 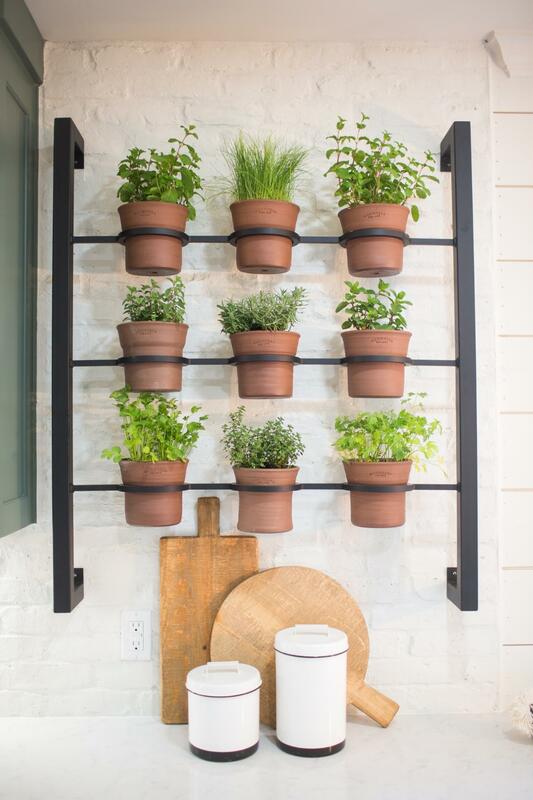 We all know cooking with fresh herbs is healthy and yummy, so why not incorporate your precious oregano, mint, basil, rosemary or thyme into the exiting space in a visually enticing way? The great thing is that these aromatic plants also look beautifully together, so obtaining a pleasing mix should be fairly simple. And since free space is often a problem in kitchens, think about placing the plants on vertical ensembles, against the wall. To create a pretty combo, use delicate pots that either match or contrast your cabinetry. The area next to the counter-top is also a good place to have your plants installed, because it allows you to have them handy while cooking. For an easy-to-maintain set, choose waterproof fabric containers from specialized gardening stores. To conclude, a strategically-placed stylish indoor plant can prove to be just as valuable and charming as a sophisticated lamp or furniture piece, so do not underestimate the level of beauty and texture that flowers can bring inside a home.